Le Cordon Bleu is a world renowned network ofC educational institutions dedicated to providing the highest level of culinary and hospitality instruction through world class programs. The opening of Le Cordon Bleu Madrid at UFV offers the opportunity to be trained in Spanish, with the outstanding quality and assurance that has always distinguished Le Cordon Bleu. Programmes: e Grand Diplôme, Cuisine Programs, Pastry Programs, Spanish Cuisine Programs, High Bakery programs, Gourmet & Short Courses. centre that belongs to an international network composed of 17 institutions of higher education worldwide. IDDI differentiates itself by its pioneering products and innovative methodologies in Executive Education, Coaching and InCompany Programs. 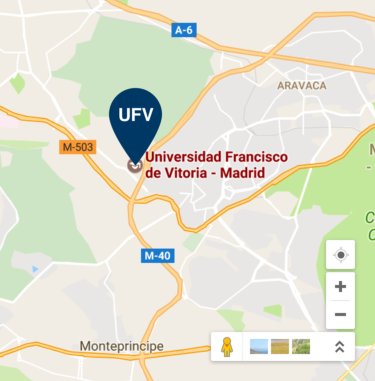 Universidad Francisco de Vitoria - ADEN Business School aims to shape the new generation of professional leaders by enabling them to unlock their potential through academic knowledge, project management as well as the perfection of personal and practical skills. Its academic strength is based on empowering people by providing them with cutting-edge decision making tools and innovative methodologies. The Higher Vocational Training Centre (CETYS) provides an effective training and education service to meet the increasing demand for technically proficient professionals in the international job market. Our teaching is renowned for its personcentric approach by means of its Higher Vocational Training schemes. Among many others, we offer official title courses in the audovisual field, administration and finance, gastronomy, the health sciences and education. 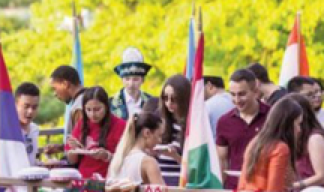 The UFV’s Department of Postgraduate Studies and Consultancy carries out various different activities in postgraduate education, offering Master’s, doctorate and UFV-awarded programmes, academic training weeks, incompany training... Always with a global and international perspective, which is reflected in the many different nationalities found in the lecturers and studetns taking part in our courses. In addition, we have many collaboration agreements with education centres from all around the world. Our success is also due to the innovative programmes we offer which constantly seek out, analyse and make use of new international training tendencies adapted to our person-centric mission.